This post has been sponsored by High Road Ice Cream. All thoughts and opinions are my own. Thanksgiving is getting closer and closer each day. Are you just as excited about it as I am?! Thanksgiving is my favorite holiday because, well, food. And you know I love my food. Today’s recipe is the perfect addition to any menu during the holidays – Thanksgiving, Friendsgiving, Christmas, Hannukah, you name it! But before we get to the recipe, let’s talk about my favorite ice cream of all time, which we’ll be pairing with this recipe: High Road Ice Cream. They coin themselves “luxury ice cream” and I can assure you that’s exactly right. They have incredible chef-inspired flavors that combine all your favorite things into one killer pint, which is evident in their flavors, like Cherry Almond Chip and Bourbon Burnt Sugar. Their ice creams have been a favorite of mine ever since I moved to Atlanta. But now you can get it all over the country. Make sure to use their store locator to find a pint near you! For today’s recipe, we’re going to be pairing it with classic vanilla ice cream. But High Road’s Vanilla Fleur de Sel is anything but boring due to the boost of flavor it gets from the fleur de sel (French for sea salt). It helps bring out the best part of the vanilla bean and balance out the richness in the creamy base. Yummmm. Okay, enough with the teasing. Today’s recipe is obviously one that pairs well with ice cream and, as previously mentioned, it’s perfect for this holidays. Are you ready for it?? Say hello to my Pumpkin Snickerdoodle Bread Pudding! Bread pudding was one of the first desserts I learn to make, probably because of how easy it is. All you do is cube some crusty bread, soak it in a custard base (eggs, milk, cream, sugar, and vanilla), let the bread soak up the custard for a few hours, and then bake. Annnnnd voila! You have a delicious bread pudding. Bread pudding is traditionally made with raisins or nuts, but this version is jazzed up a bit for the fall. I’ve replaced the raisins with pumpkin puree and added a blend of pumpkin pie spices (cinnamon, nutmeg, cloves, and ginger). And just like that, you have another delicious way to get you pumpkin fix! But wait…there’s more! As if this bread pudding wasn’t incredible enough, before it gets baked, we top it with cinnamon sugar to create a yummy snickerdoodle crust. Yup, I went there. Bread pudding is always served with a topping – whether it be vanilla ice cream or a rich yum sauce. I think a rum sauce can be too sweet and overpowering so that’s not the direction I went with this dessert. As I mentioned above, I chose to use the High Road Vanilla Fleur de Sel to top this bread pudding. I love the combination of cool ice cream on top of a warm bread pudding. Plus, the sea salt in the vanilla ice cream add the perfect balance to this otherwise sweet dessert. Bread pudding is incredibly easy to do so there are not many tips to share. But don’t worry – I still have a couple! Make sure you use crusty bread so that it can soak up all the custard. If you use fluffy bread with barely any crust, it will get too soggy and the bread pudding will be mushy and gross. The bread pudding needs time to soak up all the custard. So if you’re making the bread pudding for dinner, I recommend starting the bread pudding in the morning, and letting it sit in the fridge until it’s time to bake. Don’t forget to pick up a pint of High Road Vanilla Fleur de Sel to serve with this bread pudding. Plus, a couple extra to enjoy on a Friday night. Because you know you wanna. I’m up for anything that involves pumpkin! 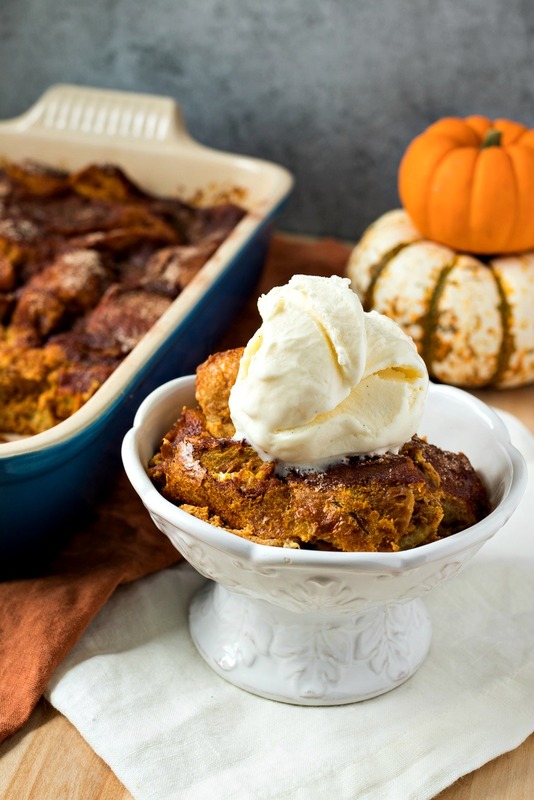 I love making bread pudding and can’t wait to try this pumpkin version. I bet the vanilla ice cream is perfect with it and need to look for High Road Ice Cream, it looks heavenly! Yes, it really is! Let me know what you think when you give it a try! Everything about this just sounds so delicious! I love snickerdoodles, so I am sure that this would be something I would really like. I love anything pumpkin I definitely have to try this recipe out. This looks so delicious! Perfect dish for Thanksgiving! Can’t wait to try this one. It is different from anything I have seen before. LOVE your pictures – they are amazing and make this a great post in my book! Aw you’re so sweet! Thanks for the feedback! Right?! It’s so hard NOT to be obsessed with pumpkin this time of year…it’s everywhere! Now this looks freaking amazing. Great pictures and wonderful recipe! I love bread pudding and this recipe looks like a homerun. I plan to try it during this holiday season. Thanks so much! Isn’t bread pudding the greatest? !